Flying into Bulawayo and having Sean and Juliet, waiting for us at the airport, felt somewhat like a homecoming. It’s a quick hour and a bit drive from Bulawayo to Cawston Ranch. I’ve been privileged enough to hunt at Cawston Ranch several times over the last few years and as a bowhunter one is always filled with expectations. The lodge is beautifully situated on the top of a kopje, overlooking a waterhole that Peter Johnston constructed some years ago. It’s such an amazing experience sitting out on the deck with a cold beer in hand, watching the game come and go serenely by. Cawston is primarily a hunting farm but no hunting is allowed close to the lodge and the animals just seem to know it. At night there’s a spotlight that shines onto the waterhole and one sees dozens of bushbuck, impala, waterbuck and kudu going about their activities. The dining room/lodge is a spacious open plan thatched area with a beautiful view to the waterhole, so that even while sitting at the dinner table or relaxing on the couches one can see the game around the water hole. 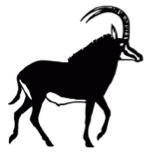 While Cawston is not a dedicated bow hunting ranch, they have a number of very well setup blinds over water, that are exclusively for bow hunters or photography clients ensuring that good numbers of animals are seen daily. 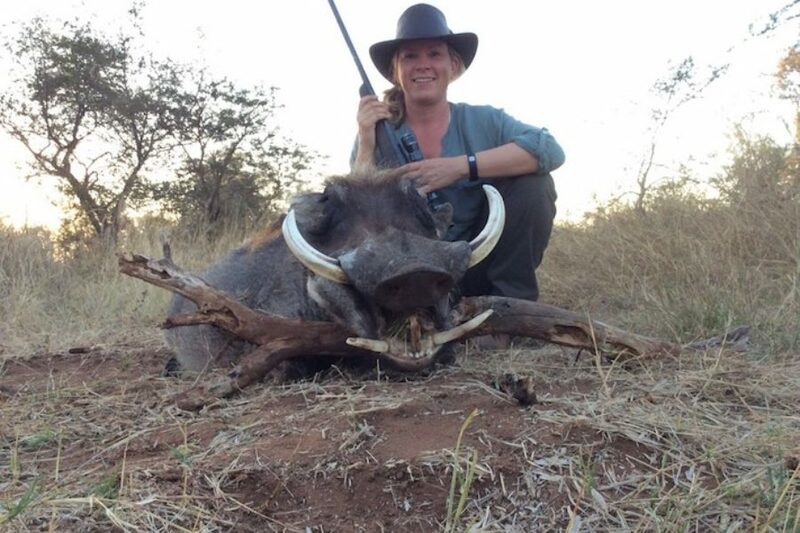 The warthog trophy quality is the best I’ve seen, and it often feels like one is a after the proverbial hundred pounder. We caught the tail end of the rut this year and I was amazed at how many broken tusked pigs we saw. 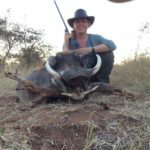 Peter Johnston had picked up a 15” monster that had succumbed to his injuries from a fight with another boar close to one of the watering holes the week before we had arrived. First morning was crisp but not freezing. I always like to try my luck with some walk and stalk first thing in the morning and so Chris, who works for Cawston permanently, was my guide. A week before we had got there, there was a severe frost and as such all the grass had died making for a difficult time whilst stalking due to the noise. Nevertheless we gave it a go. We had only been walking for 20mins when Chris spotted the rear ends of 2 pigs above the grass…go time. Luckily for me there was a little river bed that ran right past where the pigs were grazing and I managed to get onto them without them knowing. My heart was hammering in my chest (I always seem to get very bad buck fever when I’m sure I’m going to get a shot). I had to keep reminding myself to slow down and breathe, while stopping every now and again to peek over the side and make sure the pigs were still feeding unawares, which they were. I got to approximately 20 yards no problem but didn’t have a shot with all the long grass, as luck would have it , the boar turned and fed right towards me, stopping at a gap in the grass not more than 15 yards away. He was so intent on munching the grass that he never knew what hit him as the arrow zipped through his vitals. He gave a short squeal and burst forward 10 yards then stopped and looked around for the intruder that had just given him a cheap shot in the ribs, not seeing anything he walked off another 10 yards then collapsed in a heap. What a thrill. Chris called the tracker over the radio so we could load the hog in the bakkie to be taken back to the cold room while we hopped into a nearby blind for the heat of the day. 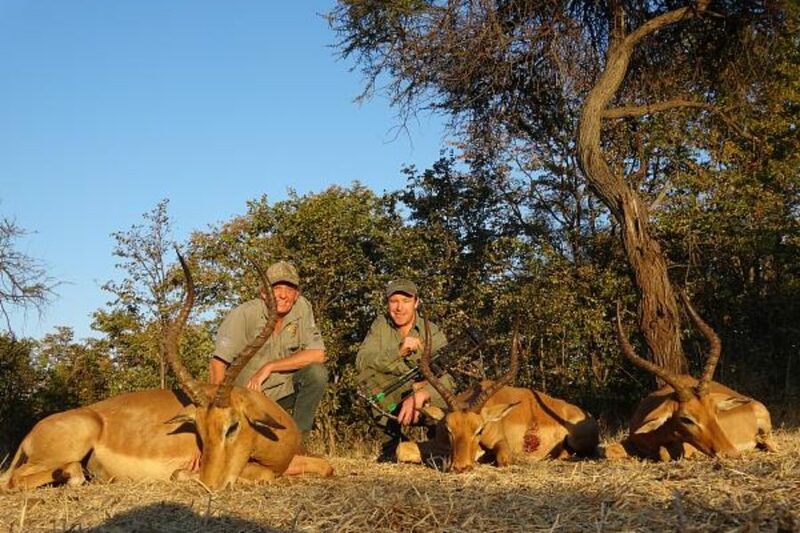 I was asked to do some culling of impala and only too happy to help I shot a bunch over the next couple of hours, always trying to pick out the oldest or least fit looking individuals. The bow creates so little noise and disturbance that a new group of impala would come in to drink 10 mins after me shooting one. Late afternoon and we decided it was time for another walk again, this time after blue wildebeest or zebra. 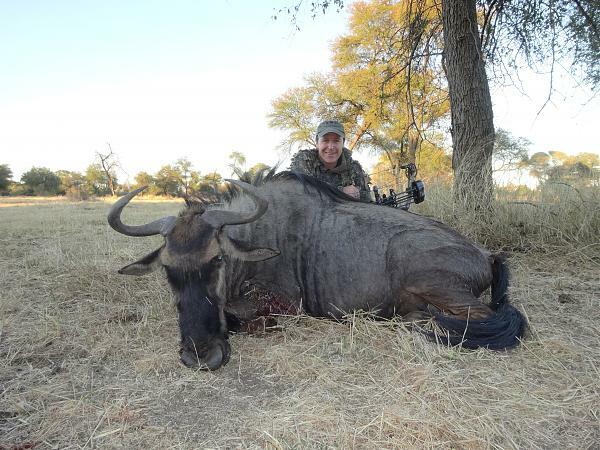 Chris spotted a large herd of blue wildebeest feeding towards the edge of some thick bush along a grassy plain, perfect. Going was extremely slow, easing through at times chest high grass and other prickly bush. Trying hard not to snag the leafy suit and bow in the thorns and branches. We managed to get opposite the spread out herd with the closest being 50 yards away, as they slowly fed towards us. Chris having picked up some movement in the bush ahead of us tapped me on the shoulder and out came a magnificent sable bull. He stopped at 30 yards and proceeded to rub his horns on a stem of a small bush, when he was satisfied with his handiwork he strolled past us at 25 yards none the wiser, a really cool experience. 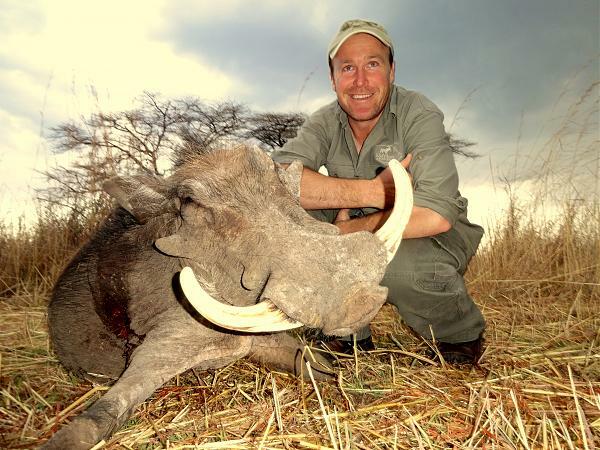 Ten minutes later an ancient wildebeest cow fed at 35 yards away, in a little clearing. I had to do some fancy ballerina work in order to find a clear shooting lane through the grass and brush that we had immersed ourselves in. Fortunately I got a 5” opening and made a perfect shot through the heart. She thundered off back into the plain but keeled over after running 50 yards. 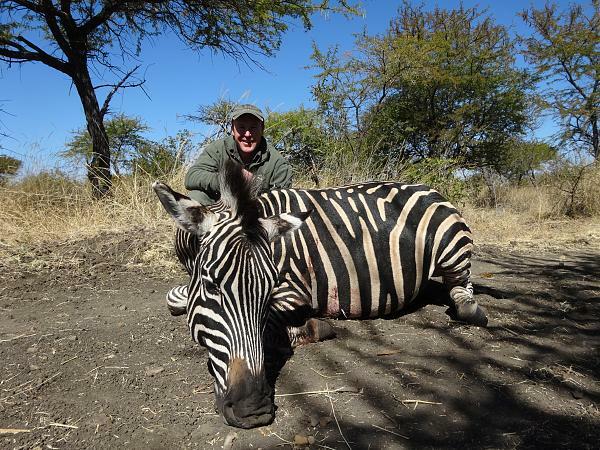 Over the next several days we shot numerous impala, zebra, warthog, kudu and a giraffe. Sitting in the lodge the last evening with a plate full of their famous giraffe tail stew was a very satisfying feeling. 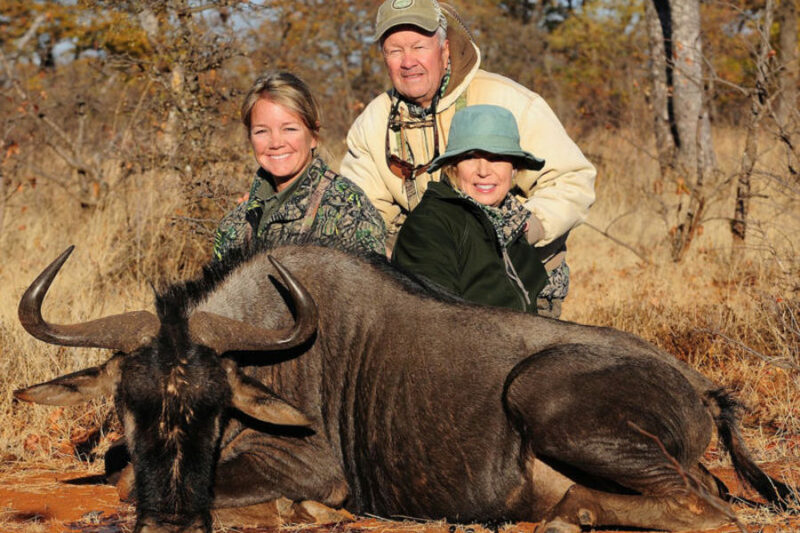 My thanks again to the crew at Rosslyn safaris for making us feel right at home and for such a wonderful hunting experience. 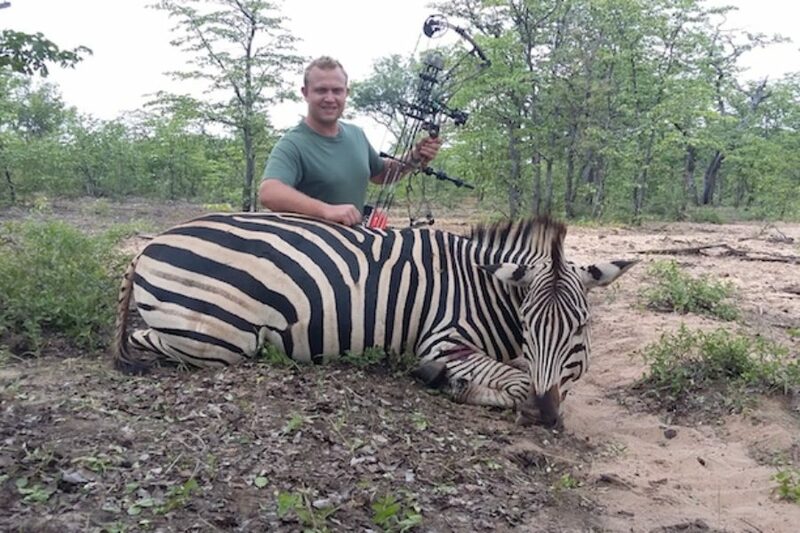 To learn more about bow hunting in Africa visit the ArcheryTalk Forum.